In July last year we featured the story of Sgt Thomas Hunter an early volunteer from Broken Hill for the Australian Imperial Force. 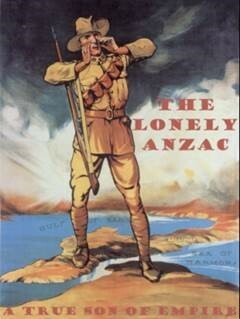 As part of the 10th Battalion he was amongst the very first ashore during the dawn landing at ANZAC Cove. Having survived Gallipoli, Thomas was deployed to France with the Battalion. During an attack on Pozieres on 25th July 1916, he received terrible wounds. He was brought back to England and died from his wounds, in the town of Peterborough on the 31st July 1916. A tremendous generosity of the spirit was shown by the people of the town towards this Australian soldier. They gave him a funeral with full military honours and it was watched by thousands of people. An ANZAC Day Commemorative Service continues to be conducted each year at Thomas Hunters’ graveside. The service attracts large numbers of people including the Mayor of the City, representatives of the Australian High Commission in London and various armed forces. This year marks 100 years since Sgt Hunter “The Lonely ANZAC” passed away and a commemorative service was again held at Peterborough Cathedral in the UK. The 10th Battalion Association had 2 representatives in attendance - Patron Major General Neil Wilson who laid a wreath and Mr Ronald Warden. Price $25 + $10 Postage & Packaging anywhere within Australia.